thank you for this pattern I am a beginner so I hope I can do this. I like to give to the local shelter so I want to start making hats. i have made 30 chemo hats that i have donated.i like to do larger and smaller ones. many thanks. When completing the crown, in the second line under each size you say “Repeat across the round.” If we are knitting with straight needles, how would it be in the round? Thanks for catching that. You are correct. That was left over from the in-the-round version of the pattern and doesn’t apply to the straight needle version. You would just repeat the directions between asterisks across each row. Knit 1 purl 1 eleven times. Slip 2 knit wise, knit one, slip stitches over. Knit 1 purl 1 four times. Then start again with knit one purl one eleven times. Hello, This is what I did but at the end after doing k1p1 4 times then k1 I had 4 stitches left to work. I worked them as before p1k1p1k1. I ended up with 97 stitches. What did I do wrong? I don’t want to begin row 2 if row 1 isn’t right. Thank you! Having four stitches left over would make me suspect the s2kp2 stitches. Make sure that you used 3 stitches that result in 1 when you make those stitches. Good point. You ended up with the correct number of stitches so you did the decreases correctly. So the problem is where the decreases are if you had 4 stitches left over after the repeats. Each repeat has 7 stitches, then the decrease and then 8 stitches. So looking across the row you should have 7 stitches, decrease, 15 stitches, decrease, 15 stitches, decrease, 15 stitches, decrease, 15 stitches, decrease, 15 stitches, decrease, 8 stitches, last knit stitch. This totals the 97 resulting stitches of the row. Sorry I meant to say the two stitches I slipped not skipped. Do I bind off after last row or thread the yarn thru the stitches while they are still on the needle? Then pulling the yarn so those remaining stitches of the piece get gathered together? Sorry, I have never made a hat before… Also how do you seam the side? Any special technique you recommend? Thank you so much for this pattern. I have been wanting to make hats to donate and your pattern is making me brave enough to try it. 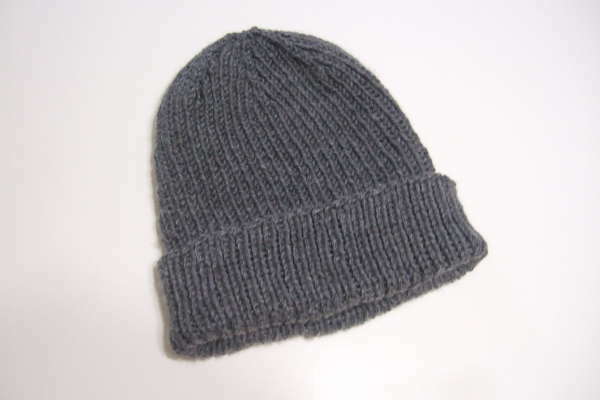 Do you have a man’s beanie pattern using sport yarn? The XL hat for men. I have a grandson with a large head, what will it stretch to in inches? Thanks for this help. I can’t wait to start this hat. It will comfortably stretch to 24″ and more. Will you tell me what the medium adult hat will stretch to in inches? I am going to use the XL pattern for my husband, but I am looking to work in 4k/4p rib is this still ok to follow the pattern as written with this change in rib size? The crown is definitely written for the k1-p1 rib, but if you feel comfortable making the necessary adjustments (swapping k/p as needed) then it would work otherwise. On the twelve month size the instructions between the * are repeated 6 times. You begin Row 5 with 49 stitches on the needle. The s2kp2 stitch uses 3 stitches and produces 1 stitch. So the stitches between the * will use 8 stitches. These repeated 6 times and the extra stitch at the end will use 49 stitches which is what you should begin with. The s2kp2 will reduce the repeated section by 2, so the row will produce 6 stitches in the repeated section. This when repeated 6 times plus the extra stitch will result in 37 stitches after the row. Thanks so much. I’ve been looking for a simple pattern like this (for straight needles) so I can use up some of my wool stash knitting for charity. It’s also nice and easy to knit during quiet times at work (night duty) when distractions can easily ruin a pattern. Thank you so much for this pattern. I have been working on some charity knitting and I only had a couple women’s hat patterns I made. This is great, because it covers all the bases and is easy to follow. Thank you so much for this pattern! I made such a cute little hat for my nephew- I customised it with a pom pom. Fingers crossed it fits him! For this row it is only repeated 3 times (subsequent rows are repeated 6 times). So 34 x 3 = 102 then an extra k1 at the end for the 103 stitches used. The s2kp2 reduces two stitches in each of the three repeats, so this results in 103 – 6 = 97 remaining stitches. This is still very unclear because in one place you say you repeat it 4 times, but you can’t because you don’t have enough stitches left. I would edit the pattern and put the whole thing in parenthesis that says it only repeats 3 times, because the “4 times” piece of this tells a whole different story since nowhere do you explain that you are only repeating this all 3 times. I am not making the hat because I think knitting in the round is so much easier than doing seams, but I did like the basic stitch counts for all those sizes, so thank you for that–it will be very helpful. I completed looking at the medium crown pattern. Instead of repeating that language over and over, at the beginning of the pattern I state “Repeat instructions between * across the row:” so that the * designated areas have the same meaning throughout. Hi found your pattern online as I was looking for a quick and easy knit for a child. Just knitted the 12 month size and can’t believe how quick it was and so easy to follow your pattern. I love it, thank you. Hi there, I’m making a hat for a toddler and I’m a little confused – for Row 1: is it k1 p1 8 times, k1 1 time, s2kp2 k1,p1 3 times, then k1 1 time – then start all over? or is it k1 p1 8 times, k1 1 time, s2kp2 3 k1, p1 3 times, k1 til the end? Thank you! Complete all the directions between the *. Then repeat them all again and again until you come to the last stitch which is a k1. Is it k1,p1,k1,s2kp2,k1,p1 then repeat k1,p1,k1,s2kp2,k1,p1 then k1 or is it k1,p1,k1,s2kp2,k1,p1,k1,p1,k1,p1 then k1? Complete these stitches – k1, p1, k1, s2kp2, k1, p1, k1, p1. Repeat the set again and again until the last stitch then k1. I am making a todder size. Do I rib for 8 inches before shaping the crown? I figured it out. The length is orinted on the top of shaping the crown in each size. I assume you are talking about the cast on row since the ribbing is reversible. I use a long tail cast on with ribbing and it never seems to have a clear front back look to it. Thank you for the pattern. I am knitting for charity again so this is very helpful. Hi there, I’m hoping to knit this with DK (8ply) wool (for 6 month size) – I am a beginner – would this require any adjustments? If you have more stitches per the gauge you might need to make a larger size to get the 6 month size equivalent. Sorry to ask but what does * mean in the pattern ? The stitches between the * are repeated across the row. I haven’t started knitting this pattern as yet but it is great to have the pattern in so many sizes. Thank you so much…. Love this pattern. Have knitted 4 different sizes …new born, 6 months, small adult and large adult. I’m quite a loose knitter and used 4 ply wool. Just love how easy it was to make. I’ve never knitted a beanie before. Now I have 2 family members wanting one . I would like to knit this hat for my adult daughter. She just sent me her head measurements. Will you please tell me what size hat I need to make for her? I would recommend the largest size. Hello, Thanks to all of your patience and help, I have finally been able to complete the hat. It turned out very nicely and I found lifelines true life savers when knitting the crown part. I decided to do the medium size because I knit loosely and the yarn I used has a good bit of stretch. I understand how to close the top of the hat with the darning needle, but I don’t understand how to seam up the back so that when the cuff is turned up the seam won’t show. Can you explain how to do that? When seaming the back do I begin at the edge or at the crown of the hat? Thank you again for helping me! What I do with a hat with a turned up edge is stitch with the seam to the inside until I’m getting to close to what will be the edge once turned up, then switch and sew the seam on the outside. Then when it’s flipped up you won’t see the seam. Can this be knitted in dk? What would be the differences I’d need to make? Just making the next size larger should be adjustment enough.